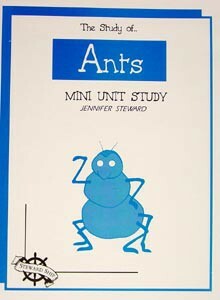 The Study of Ants Mini Unit Study, by Jennifer Steward These guides are designed to give you a plan and are more general in nature. They are not so specific as to detail what you should do each day. Contains Christian content. From Stewardship Publishing. This 1-2 week mini unit study is recommended for K-4th grade. Suggested resources include The Fascinating World of Ants, The Ant Book & Model and Fun with Insects Stencil from Dover.